Wensleydale Longwool sheep were recognised as a breed in 1876, with the focus being very much upon white fleece. 15-20% of the sheep born had a black fleece, at the time was seen as an undesirable trait. It took over a hundred years for Black Wensleydale Longwools to be accepted as a separate pedigree. which they finally achieved in 1985. Wensleydale Black Longwool sheep are a very rare breed, there are only 21 registered flocks breeding in the UK at the moment. 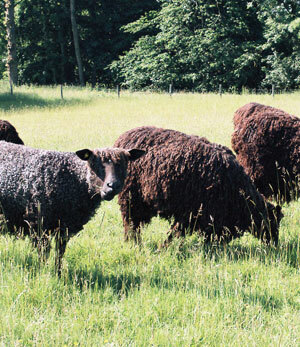 Known as the Beech Hill Flock of Wensleydales our flock has the widest range of naturally bred colours that we know of. The distinct shades of the flock are Brown Black, Raisin Brown, Charcoal Grey, Grey Brown and Silver Grey which is the rarest of the naturally bred colours. We are the only people at the moment who can produce the Silver Grey coloured fibre naturally. Because the Silver Grey fleece is very rare it takes time to be able to gather enough wool to create a production run, approx. 2-3yrs. The flock here at Causeway Farm Barn is much smaller now, most of our brothers and sisters having settled in Surrey with the expert shepherd Luke Gates. He will continue the breeding up programme. Read our partnership page to find out more about luke.